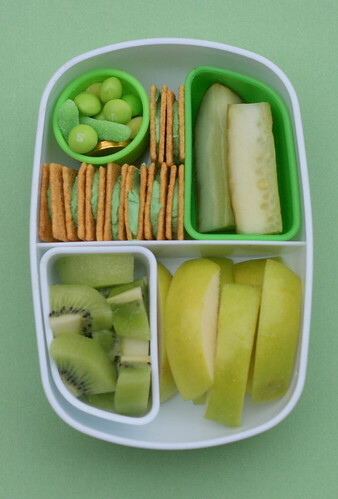 another lunch: St. Patrick's Day bento! My little lad will surely have the luck o' the Irish with him today with this lunch in hand.... and he's going to need some luck because he insisted on not wearing any green today! He has sliced green apple and kiwi fruit on the bottom; pickles, Wheat Thin crackers with green cream cheese, a little lucky silicone cup of green treats in the corner (gold coins, green gummy worm, green Skittles). 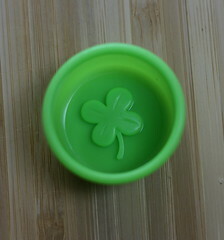 The little silicone cup is very cute - it has a shamrock imprint inside! :) I am lucky to have an Irish lassie of a friend who acts as my personal bento shopper in California. This was from her last shopping excursion. Lucky, right? Very. Cute, cute, cute. Love it! Looks awesome! What a fun green lunch :D My son was going on and on this morning about how I needed to find his green shirt or he would be pinched! Totally cute! I wish my kid would eat all those green foods! I love your blog! I bookmarked the other day when I came across it on the MTM linky. I want a personal Californian Bento shopper! 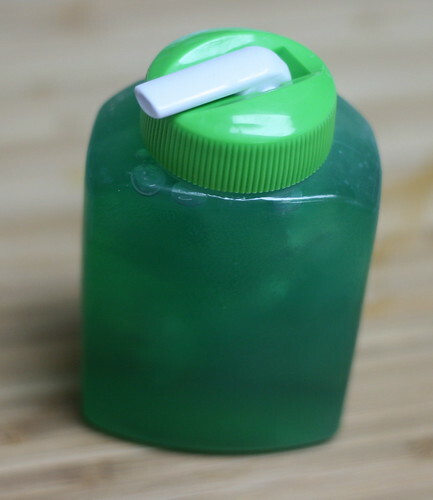 That shamrock silicone cup is way too cute!! !